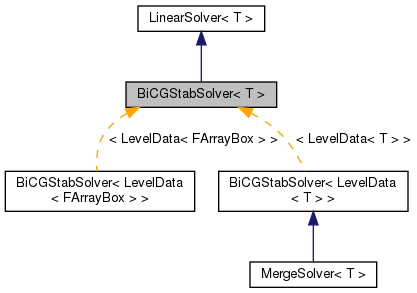 Elliptic solver using the BiCGStab algorithm. Reimplemented in MergeSolver< T >. define the solver. a_op is the linear operator. a_homogeneous is whether the solver uses homogeneous boundary conditions. References BiCGStabSolver< T >::m_homogeneous, and BiCGStabSolver< T >::m_op. References Abs(), CH_assert, CH_START, CH_STOP, CH_TIME, CH_TIMER, CH_TIMERS, BiCGStabSolver< T >::m_convergenceMetric, BiCGStabSolver< T >::m_eps, BiCGStabSolver< T >::m_exitStatus, BiCGStabSolver< T >::m_hang, BiCGStabSolver< T >::m_homogeneous, BiCGStabSolver< T >::m_imax, BiCGStabSolver< T >::m_normType, BiCGStabSolver< T >::m_numRestarts, BiCGStabSolver< T >::m_op, BiCGStabSolver< T >::m_reps, BiCGStabSolver< T >::m_small, BiCGStabSolver< T >::m_verbosity, norm(), and pout(). References BiCGStabSolver< T >::m_convergenceMetric, and BiCGStabSolver< T >::m_eps. Referenced by BiCGStabSolver< T >::define(), BiCGStabSolver< LevelData< T > >::setHomogeneous(), and BiCGStabSolver< T >::solve(). public member data: operator to solve. Referenced by BiCGStabSolver< T >::define(), BiCGStabSolver< T >::solve(), and BiCGStabSolver< T >::~BiCGStabSolver(). Referenced by BiCGStabSolver< T >::solve(). public member data: how much screen out put the user wants. set = 0 for no output. Referenced by MultilevelLinearOp< T >::define(), and BiCGStabSolver< T >::solve(). Referenced by BiCGStabSolver< T >::setConvergenceMetrics(), and BiCGStabSolver< T >::solve(). public member data: what the algorithm should consider "close to zero"
public member data: norm to be used when evaluation convergence. 0 is max norm, 1 is L(1), 2 is L(2) and so on.